Choose an envelope pattern and print it on paper. The black & white (B&W) patterns work well on white or colored paper. Color and decorate the envelope any way you like, and then follow the instructions on the pattern for assembling the envelope. For more detailed instructions and tips on making envelopes, see the Envelopes to Make craft project. To create a pretty inside lining for your envelope, print the envelope pattern on the back of decorative paper. To print your own decorative paper, select from any of Aunt Annie's ePaper downloads. The Spring Dots ePapers go nicely with the Fun Shaped Cards and these matching envelopes. 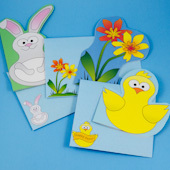 These patterns for bunny, chick and flower envelopes are from the Fun Shaped Cards craft project and match the shaped cards in the project. 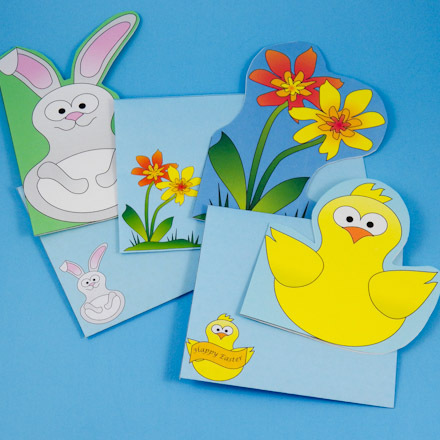 See the Fun Shaped Cards craft project for detailed instructions and patterns for making bunny, chick and flower shaped cards. For more detailed instructions and tips on making envelopes, see the Envelopes to Make craft project. 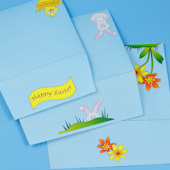 Envelopes with fun designs for spring and Easter! 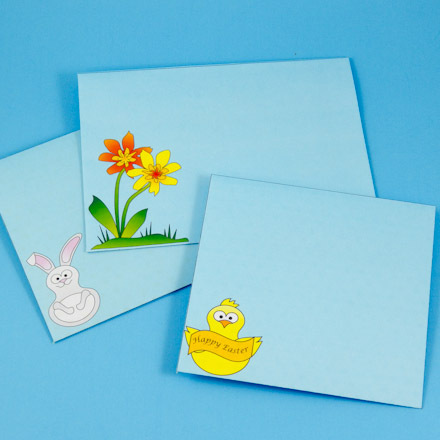 Tip: Make the super easy matching cards for Easter and spring! See how in the Fun Shaped Cards craft project. Tip: The envelope flaps also have designs that match the Fun Shaped Cards.